Okay, first I have to admit something. I love Supernatural. I don't just like it. I don't want to be friends with it. I LOVE it. Like, love-love. I love it in a way I haven't loved a television series since Buffy...and that, Dear Readers, is saying quite a bit. But, to be honest, Buffy didn't have Dean Winchester. I admit to blushing just looking at him. Now, in order to resist babbling on and on (and I could at length) about Dean Winchester and my insane love of yet another fictional character, I will now slowly scroll down the page as I post, so as not to become distracted by him. And I will say, only briefly, that I would like to be Dean Winchester when I grow up. Pain and all. I'll take it. Ah, he's my second favorite kind of hero...le sigh. 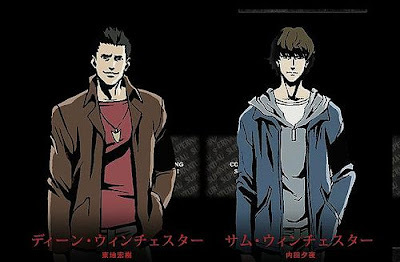 When I heard, almost six months ago, that two of my favorite things: anime and Supernatural were going to make a baby...I squeed so loudly that I think I may have pulled a muscle. How often does that sort of thing happen? It was like a gift from Chuck (who art in heaven). Maybe, just maybe, my hopes were too high? Not that Supernatural: The Anime is bad, mind you...it's just not...I dunno. I have concerns. My first concern has to do with the storyline itself. Now, being a Dean-obsessed, theory-driven, research nerd, I know my SPN. I might know it too well. The storyline of the anime follows the original, yet it feels a little sketchy or "holey." I find myself wondering if I would be able to follow theise first episodes as part of a greater story arc were I not such an idiotically huge fangirl. I know the backstory, so I feel like maybe I'm filling in gaps that unfamiliar viewers may not be able to fill so easily. That IS a concern. The selections of episodes are strange so far, and I wonder about their order and the decision-making process behind that order. It began with an episode entitled "Skins" which was fed almost directly by the live-action version, with some alterations. The next two episodes ("Roadkill" and "Home") were also inspired by the series, and shared titles with the original live-action versions. Then we start to get some new episodes, which are meant to fit within the original story line. The original episode I watched was entitled "Ghost on the Highway," and I have to say that it wasn't what I expected from the typical live-action Supernatural episode. I hate to say it, but it wasn't as well written, as complex or as interesting. And it should have been, because it was about the Impala (which may be this secret gear-head's favorite thing about the show...even moreso than Dean). I appreciate that the writers of the anime didn't just rehash the live-action series. I think that's important, and I applaud them for their efforts to create new episodes that seasoned viewers can appreciate. It's a great opportunity to add to the Supernatural storyline by creating side-stories and in-between stories to expand on the series. I just hope the rest of the new episodes are a bit more complicated and a bit more engaging. Although Ms. Shakespeare has heard me rant ad infinitum almost about this already, I have to say it again...Jared Padalecki isn't a great actor. He's pretty to look at (not as pretty as Ackles), but he's not a great actor. He has a hard time delivering lines with believable emotion, and as a result of this sort of (dare I say) deficiency, his voice-acting becomes even more wooden and awkwardly delivered. It's almost like I can hear him reading off of cue cards. In once scene he laughed, and it was the most awkwardly delivered fake laugh I have ever experienced. I felt physical shame for him, because (as most people know) I am nothing if not overly empathetic at times. I cringed. My heart sank. Oh, it was so forced and uncomfortable that it hurt me. But, at least he's doing Sam's voice. Jensen Ackles, who is an incredible actor with an uncanny sense of delivery (especially in funny or poignant moments) hasn't made a peep yet in the episodes I've seen. I know he's a good voice actor because he rocked his role of Jason Todd in Under the Red Hood...he made that film. It was stunning. Plus, his voice is at least half the charm of Dean's character. Although voice actor, Andrew Farrar, does a passable job...he just isn't Dean. In fact, he comes off a little less tough, and a little more goofy in a way I don't like. Dean is equal parts both, and Ackles walks a fine line in the live-action version between lovable goof-ball and angst-ridden knight in shining muscle car. I've seen reviews that say that the two episodes he voiced are far more emotional and effective than the earlier ones, but we'll have to save that for a later Winchester Wednesday post. While I'm on Dean (which is something I would never pass up), I have to say that the animation leaves a little less to be desired. Padalecki already looks a bit like an anime character, but I was imagining Dean much differently than the way he was presented in the series. I believe I said, ALOUD to the tv, "Come on, Dean is hotness personified...draw him better." Dean and Sam animated. Sam looks good. 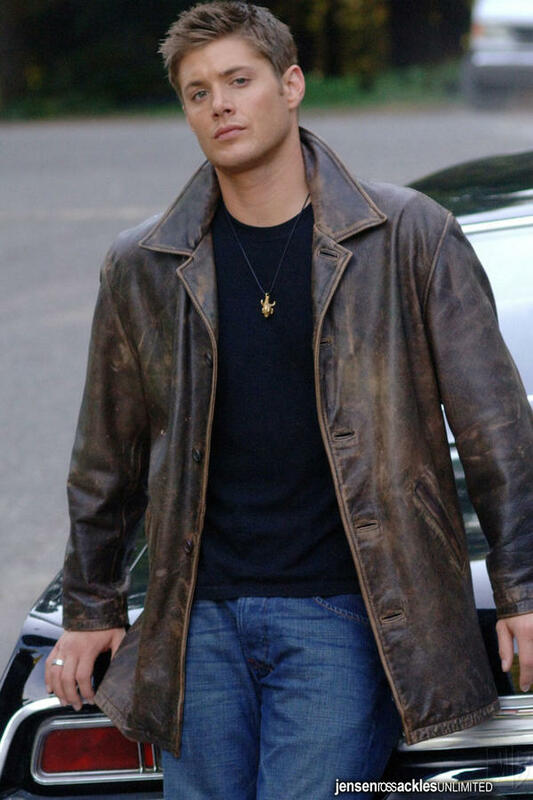 Dean looks...weird with dark brown hair. I will, because I am obsessed, complete the series, and I'll try to keep an open mind. As it is, I don't think this series has done a poor job with the translation from live action into anime, it just hasn't been all I expected. I will enjoy the monster of the week feel, and found myself laughing at the COMPLETELY awkward live introductions to each episode done by Padalecki and Ackles...again, I got these weird pangs of empathetic shame-facedness when they came on the screen to introduce each episode; they are so obviously uncomfortable that it hurts me. Maybe my concerns will be aliviated as the series progresses--I promise to give it a fair shake. **Don't skip over the closing song when you watch this series. The J-pop version of Kansas' "Carry on My Wayward Son" is something to be heard...not admired, mind you, but heard nonetheless. Really, really funny stuff!